Take a break from the digital, distracted madness of modern life and hit that big reset button in your heart through the simple, magical ritual of singing together! Looking for a way to connect with your neighbors, have fun, make a joyful noise and make a difference? Take a break from the digital, distracted madness of modern life and hit that big reset button in your heart through the simple, magical ritual of singing together. 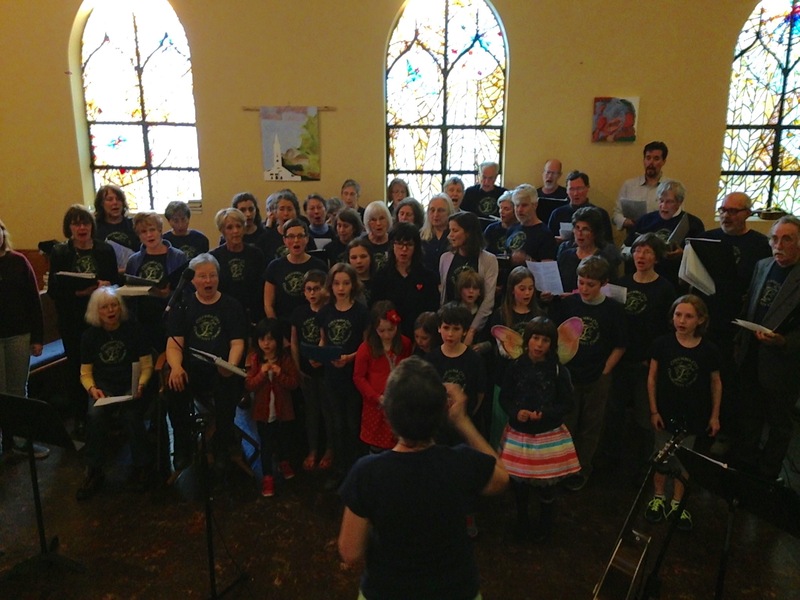 The Columbia City Community Chorus welcomes people of all ages and musical training to come together in a fun, inclusive and spirited singing community. There is no audition, and no singing experience is required, just a desire to sing in harmony with others. We are not affiliated with any particular religion or spiritual path. The CCCC’s guiding philosophy is that singing is a deep expression of our humanity, and singing together opens hearts and builds community. Our repertoire reflects the rich cultural mix of community music sung around the world, and the soulful inspiration of director and composer Kathleen Tracy. This year we raised $1600 for Plant for the Planet at our Spring Concert. Thank you all for your generosity! Me and the Chorus sing our anthem Shine (by yours truly) on this beautiful compilation album organized by 350 Seattle, a group dedicated to “building a passionate grassroots movement for climate justice.” Download it for FREE or pay what you want by going here. Funds support the excellent work of 350 Seattle. The CCCC capped off our 2016 Fall Session by videoing ourselves singing Light Returns Again. A song for our times indeed.